The tendency of many of the skinks to live below the soil’s surface has led to independent reduction of limbs in several groups. It is not clear whether some of the animals so specialized really spend most of their life underground, resulting in a reduced reliance on limbs for locomotion or stabilization. 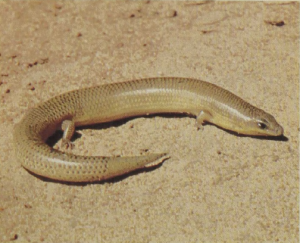 The body of this 6- to 10-inch-long snake skink has become long enough to make lateral undulation an effective motor mechanism. The elongation has, however, proceeded quite differently from that seen in amphisbaenians: rather than stretching out the body, skinks have tended to extend the tail, and, in many species, the diameter of the tail is almost identical to that of the body. The curves of the trunk may then pass smoothly onto the tail and the tail may also assist propulsion, increasing the effective length of these animals. In many skinks the tail also houses large strips of fat providing energy storage that may be used during the reproductive period.